"The ability of 1-2 billion output value to resist risks is far from enough. If it can become a listed company, it can not only make big brand influence, but also the company can grow bigger and stronger quickly." Li, general manager of Shenzhen Lehman Optoelectronics Technology Co., Ltd. One of the things that Man Rail has been busy with recently is to push the company onto the GEM. At present, the LED industry has entered a period of rapid development, and various funds have poured into this green field of â€œlow carbon, energy saving and environmental protectionâ€. With the deepening of competition, the listing financing has become bigger and stronger and has become a small and medium LED enterprise. The urgent need for development. It is understood that Shenzhen is currently planning no less than 10 LED companies listed on the SME board or the GEM, like Lehman Optoelectronics. Wanrun, Bangbeier, Maoshuo Power, Lianjian Optoelectronics, Ruifeng Optoelectronics, etc. In the listing plan, many other companies have completed the shareholding system transformation. In the interview, I learned that most of the LED leading enterprises in Shenzhen are full of orders, which are in short supply. Li Mantie told reporters: "The company's production capacity has doubled to meet the demand for existing orders. To do this, at least tens of millions of yuan must be invested in this scale." At present, Lehman's orders can meet at least one quarter of production capacity, and now the company's production line Starting 24 hours a day, still can not meet the demand for orders. Gong Weibin, general manager of Ruifeng Optoelectronics, which is separated from Lehman Wall, said in an interview that the company's operation is entering a stage of rapid development. This year, the total output value is expected to increase by more than three times. "Our order this year is enough for a year." ." According to a sales manager of Wanrun Technology, the company's order this year can be completed in September and October. The company started out as a package and gradually entered the application fields such as lighting. The company's sales last year reached 400 million yuan. In 2008, the proportion of LED applications accounted for 30% of its total output, which accounted for 40% in 2009 and is expected to reach 50-60% this year. This reflects the rapid growth of the LED application market from one side. According to the data provided by the National Semiconductor Lighting Engineering R&D and Industry Alliance, the sales value of China's semiconductor lighting industry reached 60 billion yuan in 2009, a year-on-year growth of more than 30%. China has become one of the fastest growing regions in the global LED industry. It was learned from the Shenzhen LED Industry Association that the output value of Shenzhen's LED industry exceeded 20 billion yuan in 2009, a year-on-year increase of more than 30%, far higher than the average growth rate of 5% in China's lighting equipment manufacturing industry. RGBW bulbs add RGB colorful light based on the traditional warm light, they are suitable for home, bars and offices. Once turning on the RGB colorful lighting, you can begin the party anytime and anywhere with your family and friends. Users can choose the light mode according to time, scene, mood, and also can adjust the brightness, color temperature and color of the light. Using energy-saving and high-quality LED lamp beads, the light source is stable without stroboscopic, the effective life can be more than 20000 hours. Our LED products can meet global quality standards and pass European testing by TUV Rheinland. Bulbs have certifications such as EMC, RED, LVD, ROHS, REACH, ERP and FCC. With the exclusive designed 2.4G remote controller, get you off the switch and turn on / off the lights anywhere, one remote controller can set 4 groups, each group is recommended to match up 8pcs bulbs, one remote controller can max control 32 bulbs. 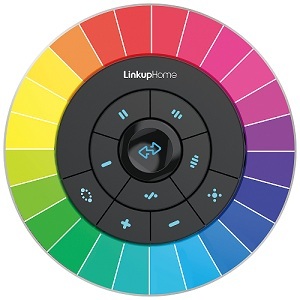 This remote controller is suitable for all 2.4G versions of RGBW products under [linkuphome". The remote control uses colorful touch buttons, the color touch buttons are comfortable and sensitive. The remote controller has the functions of grouping, lighting, brightness adjustment, color light automatic cycle mode, three cycle speeds can be choosed. The wireless control distance is around 20 meters. Low power consumption makes the remote controller only need 4pcs AA batteries, but can be used for two years.